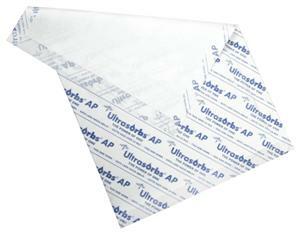 Ultrasorbs AP Premium Disposable DryPad: Air-Permeable, moisture-proof backsheet provides superior skin dryness and comfort. Advanced thermo-bonded SuperCore wicks moisture away from the skin and locks fluid away for increased patient dignity and better skin care. Super absorbent - one Ultrasorbs AP equals the absorbency of three or more traditional underpads. Exceptional odor control. High-strength pad and film provide exceptional resistance to tearing and resulting linen changes. Indications for Use. Open-airing incontinence management, ICU/CCU patients who should not be disrupted/moved more than necessary, ER for absorbing significant/ongoing fluid loss, labor and delivery, OR use, any other area where skin dryness is needed. Ultrasorbs AP, 31" x 36".